Most people can easily identify between an RJ11 and an RJ45 wiring, and point out the differences and specific uses of each. But when it comes to an RJ45 and an RJ48, it becomes a little bit more difficult. This is because they usually use the same modular connector and the differences between the two are not easily identifiable. RJ which stands for registered jack does not actually identify the type of connector that is being used. Instead, it identifies the wiring that is being used. These two RJ types therefore differ only in how they are wired. Both RJ48 and RJ45 use the 8P8C modular plug and 2 pairs of the wires, one pair for transmitting and one pair for receiving data. The RJ45 that we are already very familiar with uses the pins 1,2,3, and 6 for receiving and transmitting data. With RJ48, there are a few configurations that can be used depending on the situation and how they are to be used. One configuration uses the pins 1,2,4, and 5 while another uses 1,2,7, and 8. Other wires are also used for extra shielding while the remaining wires are reserved in case some uses would arise in the future. RJ45 is used mainly in local area networks where the distances between each network element is relatively short. This is very common in a lot of offices and homes and is the main reason why it has become very popular. RJ48 is used in other applications, the most common one would be in T1 data lines where the wires can extend longer distances and are often exposed to the environment. To protect the integrity of the signal, RJ48 wirings use STP or Shielded Twisted Pair cables. 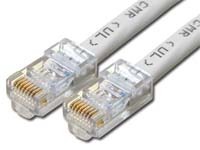 RJ45s use the more common UTP or Unshielded Twisted Pair that have categories 1 to 6, with cat5e being the most predominantly used. Whether RJ45 or RJ48 is to be used is dictated by the hardware. It is no longer up to the consumer to choose. Just make sure that you wire your connectors properly to what the hardware needs so that you have a working link. Ben Joan. "Difference Between RJ45 and RJ48." DifferenceBetween.net. May 19, 2011 < http://www.differencebetween.net/technology/difference-between-rj45-and-rj48/ >. Iam satisfied with the contents that i got in this site . And it was clear to understand what ever i want to know. although it is clear from he answer, but can we say that RJ45 and RJ48 can be used for the same purpose…say suppose..my equipmnet is having rj48, so can i plug rj45 in it as well. Yes you can. But it wont be working ! Good, simple and precise article , good work keep it up. Despite the widespread misuse of the designation, computer Ethernet connections are NOT RJ-45, and never have been. RJ-45 is a mostly obsolete configuration used to connect a modem to a telephone line with a programming resistor which sets the transmit level to suit the line. The plugs used for an RJ-45 connection aren’t even the same, although admittedly they appear similar at first glance. But a true RJ-45 plug is a keyed type, which will not fit the unkeyed 8-position jacks used for Ethernet. Would there be an effect if an RJ45 is used on the NIU all the way to the customers CSU instead of RJ48c? Will there be errors on the interface if this is the scenario? I think you are confusing the RJ45 with the RJ45S. The S is keyed and used for T1 lines communications and the RJ45 is not keyed and can be used for LAN connections. I made a mistake the RJ45S was used for telephones and keyed not T1 but the RJ45 can be used for LAN connections. Once I have this pin out below in a Rj45 it will work as a Rj48 no matter where the other colors go? I found it great the article. I was one of those who thought that RJ45 was the connector. And the differences were explained very clearly. Thank you. I’m an electrician and server manage technician. I also manage the servers for Phi9. I really don’t know the difference of RJ48 connector before? your great information helped me in short time. This article is wrong. RJ45 and RJ48 are NOT interchangeable. RJ stands for Registered Jack. RJ45 has 8 pins (8P8C modular connector). RJ48 has 10 pins (10P10C modular connector). The RJ48 is slightly wider due to the additional pins. No, RJ50 utilizes a 10P connector. Different protocol than this conversation. Oh my goodness, someone is wrong on the Internet. I’m on it! I’m afraid this article is wrong. The RJ, i.e. Registered Jack, connector standards are defined in the US Code of Federal Regulations, and the RJ45S is the ONLY type of RJ45 connector defined. It is keyed and does not fit in a generic 8P8C socket. The R in RJ specifically refers to the jacks designed for compliance with the FCC registration program, and doesn’t refer to a more general standard where there could be an RJ45 that is unkeyed and isn’t an RJ45S. The only argument for adopting RJ45 as a synonym for generic 8P8C is that almost everyone already calls it that. So at some point you just have to say, “OK, now it also means that.” Since the RJ45S is obsolete, there isn’t really any down side.